Sean Maher presents The Zealot's Lore: Gotham Central Free Comics Giveaway, Part Duex! We have a winner in the first part of the Gotham Central giveaway! Behold, Good Mister Sean Witzke (no relation) has jumped on board the book and will soon receive a little bonus for his efforts. Look how happy he looks! Enjoy those books, Mr. Witzke! 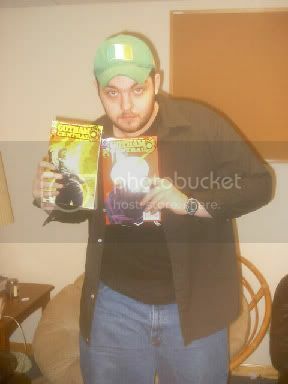 I'm glad to know you'll be enjoying Gotham Central with the rest of us lucky readers. Here's the thing. I'm having a lot of fun pimping out this great book and trying to get you people reading. I really want people to start checking out this book. So I don't want to stop just because one guy won already. And I just remembered that the first five issues of Gotham Central were released in a nice, cheap $10 trade that would really fill in the space to the left of my "Half A Life" trade nicely. You know what THAT means. That means five more extra issues of Gotham Central sitting around my apartment, looking for a good home. Everyone else who posts a picture (or a link to a picture, which I guess is more realistic) of themselves holding #28 and #29 by the end of the week (let's call it 12:00 Sunday) will be thrown into a hat and the one will be chosen randomly to have the FIRST five issues sent to them for free! Sound good? Go buy some great comics!